I used to frequent The Cabin from 2003-2004 when I was training nearby for my old job with a local cable company. Although I quit the nightmarish job in 2005, I never quit visiting this restaurant. I even got Mom hooked on coming to this quaint "log" cabin located on a woodsy Middleboro road. 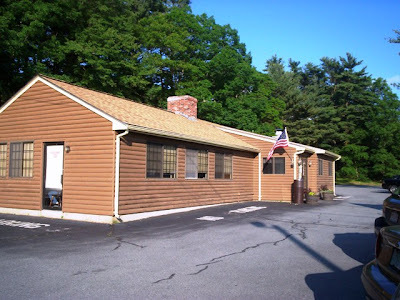 Since we hadn't been in a while, and we hadn't given it an official New England Bites review, we decided to stop in for dinner at around 6 p.m. We were hoping that the place wasn't packed, but luckily we had gotten in just before the Saturday night rush. It's adorable! 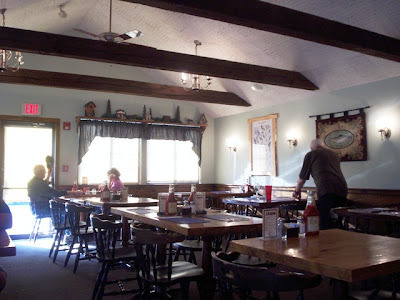 The restaurant has a very homey feel, and from the wooden tables and chairs to the exposed beams and country decor, you really do feel like you're dining inside of a log cabin. On the stone wall in the dining room hangs a large blackboard with the daily specials, and when you first enter the restaurant, there is a small bar area and brick oven where they make all of their homemade pizzas. I always love walking into The Cabin because the smell of food cooking is fabulous. After Mom returned to the table and I explained what had gone down with that annoying little boy, our waitress, Leona (according to the receipt), joined us. She took our drink order - two Diet Cokes - and gave us a few more minutes to narrow down what we wanted to get. 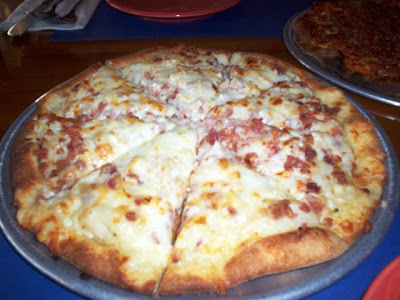 We were both in a pizza mood, and I was going to get their pizza of the day (pepperoni, bacon, garlic, and mushrooms) until Mom saw a pie called the potato skin pizza, which was sauceless and topped with mashed potatoes, bacon, and garlic. SOLD! When Leona returned, we were ready to order. I went with the potato skin pizza ($7.45) while Mom made her own with linguica and bacon ($7.20). Leona commented on how good my pizza choice was, and I couldn't wait to have some for myself. The Cabin really has some excellent food choices, but a lot of folks come here for the homemade stone oven pizzas. Starting at $5.50 (with $.85 per topping), you can really get creative and put just about anything on the 10" pie for a low price. Specialty pizzas range from $7.45-9.95 and include eclectic toppings like shrimp, scallops, and artichokes. 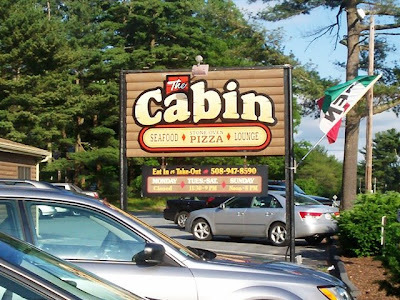 The Cabin also serves pasta dishes ($8.50-12.95), fried and fresh seafood favorites ($8.95-19.95), and wraps and sandwiches ($5.95-12.95). Cabin favorites include the baked stuffed chicken ($9.95), chopped sirloin ($9.50), surf & turf ($14.95-16.95), and a chicken quesadilla ($9.95). They also have a dessert menu with fried ice cream served with hot fudge and whipped cream ($4.50) It really is comfort food at its best. Considering we had ordered two homemade pizzas, they certainly didn't take long to arrive at our table. Both pizzas looked and smelled delicious, and we each stole a piece off of each other's pan. Mom certainly chose two tasty meats because she said that her pizza was full of flavor. The Cabin doesn't skimp on toppings, either. 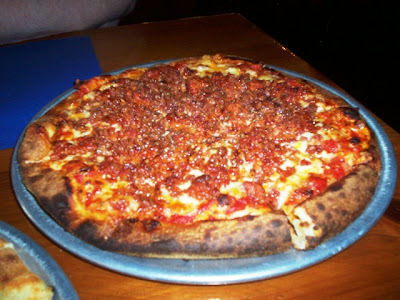 The linguica was lean and mildly spicy, while the bacon ... well, bacon rules everything. Mom said that it was one fantastic pizza, right down to the nicely thin crust. Even the older gentleman who seated us earlier gave Mom a thumbs up for ordering linguica. My pizza tasted exactly like a potato skin! If you would have blindfolded me, I would have been shocked to find out that I wasn't eating a bacon topped potato slice. The potatoes were plentiful, and the bacon and garlic flavor gave a kick to each bite. It definitely was a heavy choice. I probably shouldn't have forced down those last few pieces, but it was too good to leave behind. Although we don't really have to say it, we will definitely be going back to The Cabin. We've had several meals there - everything from chicken Parmesan to Greek salad - and they have always been fantastic. The service is always great, the prices are excellent, and the portions are large. Luckily for me, I can leave my camera at home on my next visit (I'm still mad at that damn kid). The Cabin is open from 11:30 a.m. to 9 p.m. Tuesday through Saturday, and 12-8 p.m. on Sunday. They are closed on Monday.